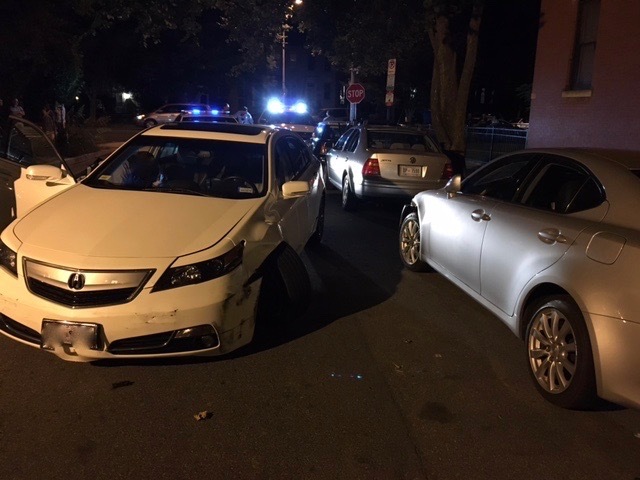 “At about 9:00PM Sunday night a DUI driver crashed into multiple vehicles in the area of NJ Ave & R St NW. The incident began as a routine fenderbender – a white Acura sedan rear ended a blue sedan heading northbound on NJ Ave. After the initial collision (which caused a chain reaction crash – more on that later) things took a turn…the white Acura attempted to leave the scene, ramming the blue sedan a second time! – although his engine was disabled you could hear him pressing on the gas pedal in an attempt to continue fleeing. Fortunately the ‘driver’ did not attempt to exit his vehicle or flee on foot. At this point the whole neighborhood was out – most folks on my block witnessed the second ‘ramming’ and the attempt to flee down Warner Street. I had phoned 911 and MPD and DCFEMS responded quickly. The blue sedan driver was sent to hospital for whiplash, mostly as a precaution. MPD took the Acura ‘driver’ out of the car and performed field sobriety tests, ultimately placing him under arrest. Returning to the initial chain reaction crash – the white Acura actually pushed the blue sedan into another car, which was also pushed into another vehicle (white older Mercedes and a jitney bus). Both of those vehicles also took off immediately! So, we had two successful instances of leaving the scene, along with the white Acura’s attempt (which really just compounded his problems). Overall a very harrowing and scary experience. There was a moment it looked like the Acura might mount the sidewalk when he lost control heading towards Warner – very scary as there were dozens of people out watching this unfold. Props to the neighbors for all coming out after hearing the initial boom and working to document the subsequent destruction, and to DC gov’t agencies for quickly responding and rendering aid. Full disclosure: I’m the owner of the parked sedan that was struck on Warner. I had parked it there a moment ago and had the pleasure of watching this drunk ram my car at 20+ mph. I was standing on the NE corner of NJ Ave and Warner St. About 60 seconds prior I was sitting in the car he struck – very close call and surreal.